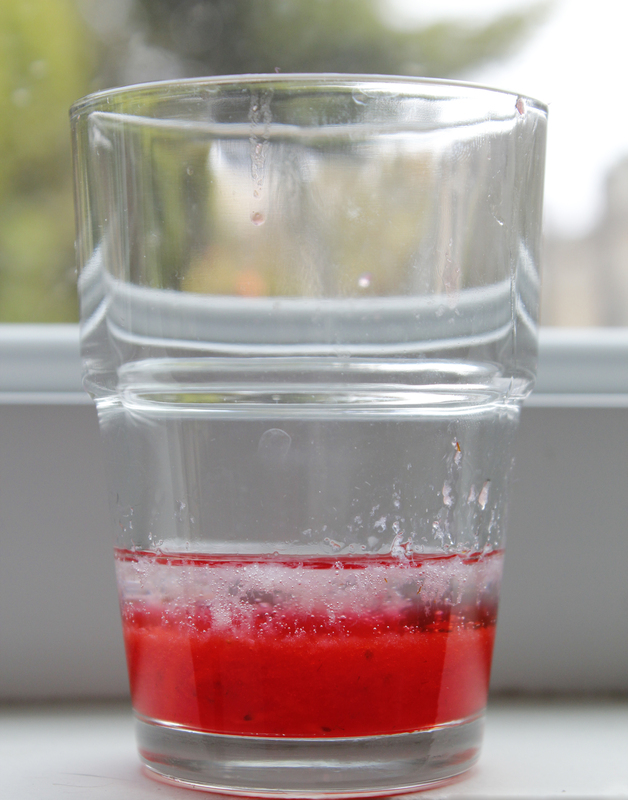 DNA is a fascinating realm to investigate, but one I assumed was out of my league…that is, until my nine-year-old heard about extracting DNA from strawberries and wanted to try it at home. There are a variety of approaches outlined on the web, often calling for thermometers, holding baths, denatured alcohol, and/or soap containing a very particular agent (EDTA). We tried several approaches, using different recipes, brands, and timing, and were consistently and remarkably unsuccessful. We kept at it, though, and when we finally got the extraction procedure to work, it was embarrassing how easy it was. Apparently the more intricate the process, the less likely you are to succeed. Disclaimer: As you might imagine, it is impossible to see the double helix with the naked eye. You may want to mention that to your kid to avoid any later disappointment. Using the method outlined below, you will see clumps of DNA, not individual strands. That’s it! 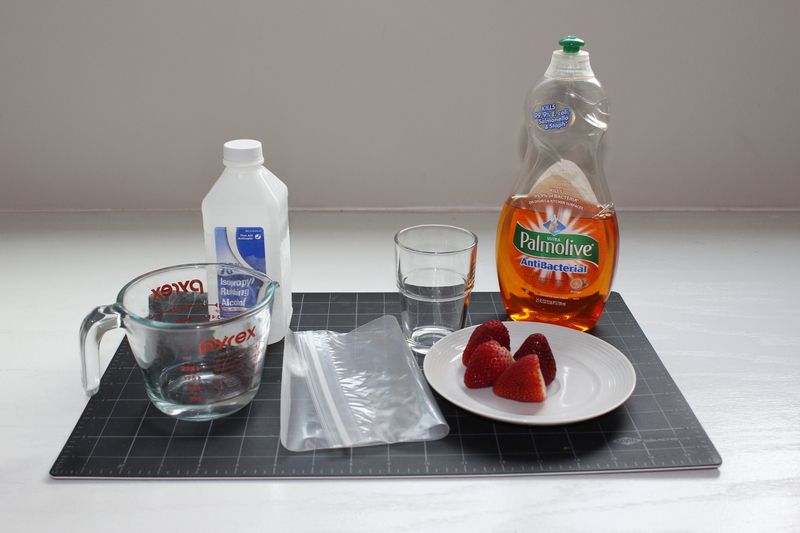 And, once the rubbing alcohol is cold, you can do this activity in about 15 minutes. **Gina says: This is the niftiest experiment ever. I was telling my office-mates about it, and they sent me here. What a fabulous follow up! DNA is inside every living thing. Our DNA contains the information that helps determine who we are, what we look like, how we develop, and many of our bodies’ strengths and weaknesses. Because it is so important, DNA is kept in a very safe place: inside the walls of the cells. 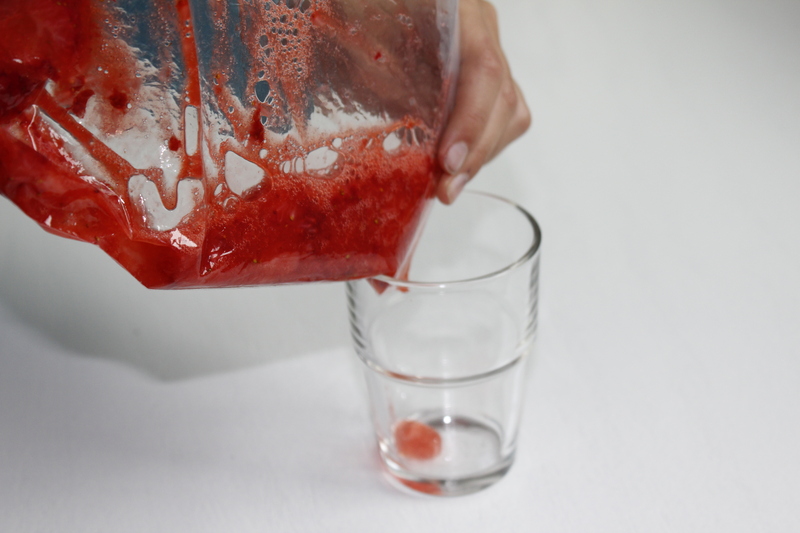 For this project, we break these cell walls by crushing the strawberries to a pulp. 1. 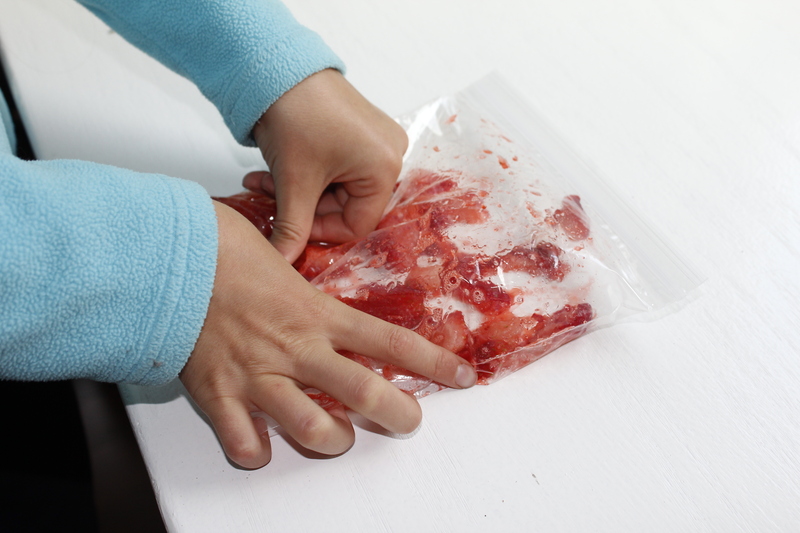 Put the strawberries in a ziploc bag with a teeny bit of water (a tablespoon or so). Let the air out of the bag and seal tightly. Then, squeeze the bag to crush the berries as completely as possible. 2. Pour the liquid into the glass, trying not to let any remaining chunks fall in there. You could strain it, run it through a coffee filter, or just cut a very small hole in a bottom corner of the bag and let the liquid pour into the glass. 3. 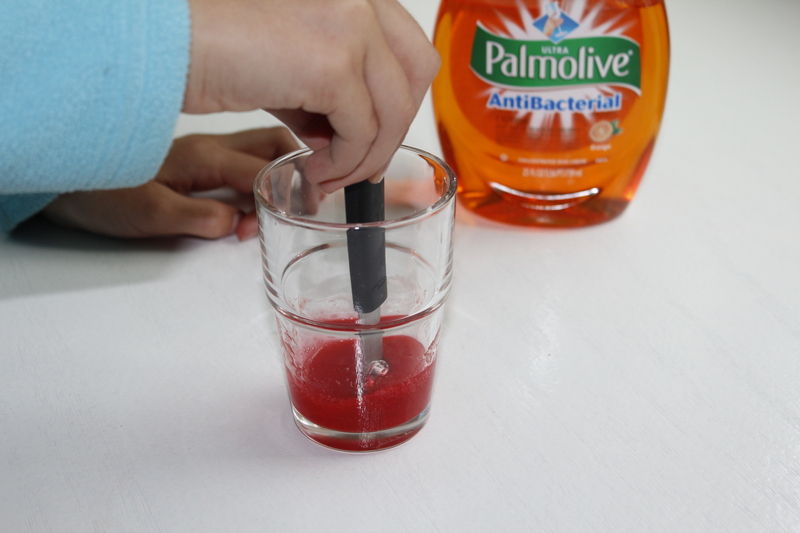 To break down the walls of the nuclei, add about 1/4 tsp of dishwashing liquid to the strawberry goo and stir the solution completely. It is ok if the solution gets a little frothy. 4. 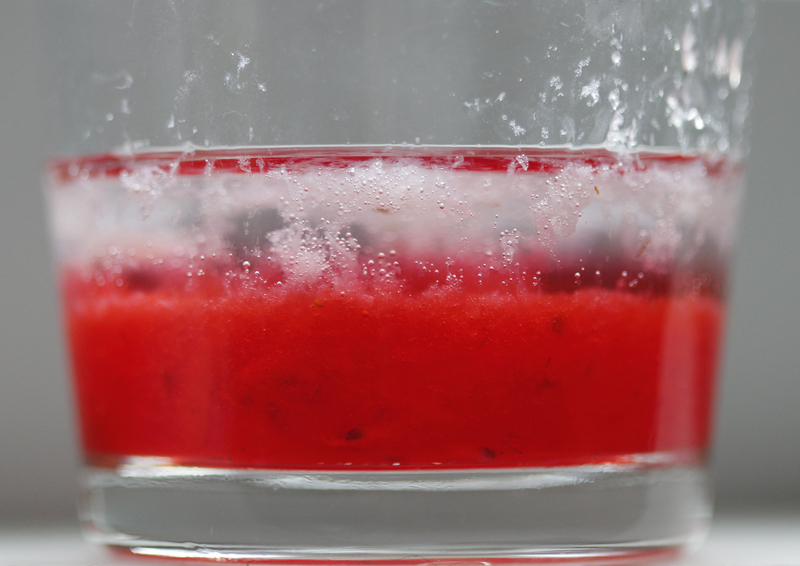 Now for the hardest part…very gently pour rubbing alcohol so that it rests on top of the strawberry goop and does not mix. Tip the glass a little to the side, as if you were trying to pour a carbonated beverage without getting a lot of foam. Because the DNA does not like the rubbing alcohol, it tries to pull away and clumps together. If nothing happens immediately, set the glass carefully aside and wait for a few minutes. Look again. Those white blobs and strings you see rise up into the alcohol are actually clumps of DNA! How cool is that? Now might be a good time to discuss possible applications for genetic information: proving someone’s guilt or innocence, modifying agriculture (whether you support the practice or not, it is certainly being done), medical recommendations, and on and on. There are many books about DNA for kids, including a series by Fran Balkwill called Enjoy Your Cells that looks intriguing. If you have any books you or your child would recommend, please let us know. Previous Previous post: Cabbage Juice Chemistry!